Vice President Yemi Osinbajo, on Saturday April 30th, shared the journey that led him to become the Vice President of Nigeria. 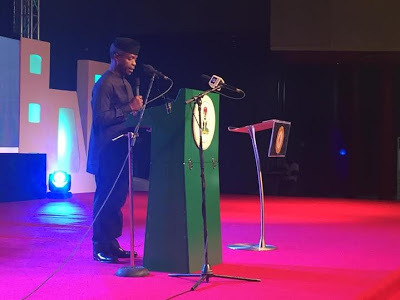 Speaking at the Platform Abuja, Osinbajo narrated how his drive for integrity and forthrightness led him and some others to form a group of concerned professionals that will speak against corruption. “As a young university lecturer, then I was impressed by his, President Buhari’s single-minded fight against corruption and indiscipline. NngThere was a serious war against indiscipline. For the first time, government held corrupt officers accountable. 30 years later, providence brought us together. A retired general now and a Professor of Law. We both believed that our country needed to change. We argued about how and what needed to be done. We reached consensus on many of the major issues. Certainly our country need a different set of values; a new way of doing business; an economy that is able to give opportunity to young people to work in their chosen professions and to build strong and profitable businesses. We knew that we had to provide social protection for the poorest and the most vulnerable. We recognised that innovation and change will be key, and that we must implement and not just talk about diversification of our economy. So we led our party’s campaign on that single, simple, but profound word, CHANGE! Nearly a year on- there are many problems and many have asked where is the change? Is this the change we voted for? Even some fifth columnists in our midst have suggested bring back corruption! “But let me just say here for the records that the government of Muhammadu Buhari is completely and irrevocably committed to change”.